On 21 March, a tiny spot near the Sun's east limb marked the end of a spotless stretch that started on 6 March. 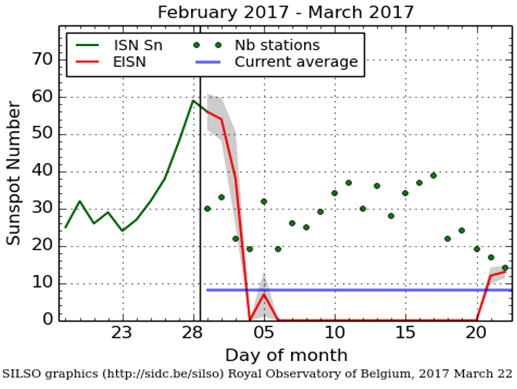 That means that no sunspot had been observed for 15 consecutive days (preliminary numbers). This is the longest stretch of spotless days for the current solar cycle transit SC24-25 (see the SILSO-data and the plot underneath). To put this period somewhat in perspective, we have to go back all the way to 2008-2009 (the previous solar cycle minimum) to find spotless periods of comparable duration. The table underneath provides a list with the most recent stretches of a specific number of spotless days (for 15 days and more; column "Period ISN=0"). There have been of course many more such periods in the past decades (except for 29 days). 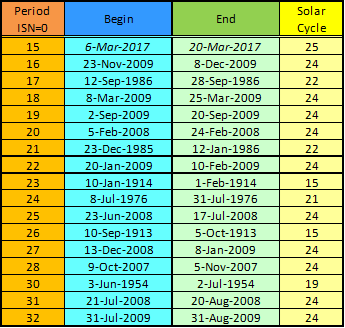 The previous solar cycle minimum was long and deep, as can be judged from the numerous SC24 entries in the table. Nonetheless, the 6-20 March 2017 spotless stretch has wiped off the 21 May-4 June 2008 period from the table. With the solar cycle minimum just starting, many more and much longer spotless periods can be expected. A table with all the spotless periods of 30 or more consecutive days (since 1849) can be found at the dedicated SILSO's Spotless Days page. The next update of this page is scheduled for early April.